Yahoo! has a set of Woodward & Bernstein’s running down the Reggie Bush scandal. It is hard to keep to claim an unbiased look at the reporting going on which makes the large amount of criticism I’m about to level seem more questionable than it is. Yahoo! 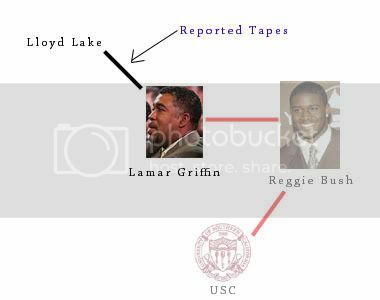 is reporting that there might be taped conversations of Reggie Bush or his family discussing money and gifts they received from Lloyd Lake. Yahoo! Sports has learned that LaMar Griffin spoke with federal investigators in the spring of 2006 and acknowledged the existence of the tapes. In an appearance before a grand jury on Jan. 12, 2007, Lake’s mother â€“ Barbara Gunner â€“ testified that she had heard portions of tapes made by her son, in which LaMar Griffin states that Bush intended to repay New Era Sports financiers “their money,” as well as for a car that was purchased for the former USC running back. Yahoo! can only cite several anonymous sources as stating the tapes exist, and yet they literally cannot narrow the content of the tapes down more than saying that they have Reggie Bush and/or his family. 1. Currently, no one has a gooddamn clue what is actually on these tapes. But you wouldn’t know that here or here. As usual ESDBS has a more reasoned view on the situation and puts the clamp on Yahoo!’s, at best, unethical overreliance on the most flimsy of facts and sources. In anycase, while I will concede, as Orson says, that Bush being declared ineligible for 2005 got more probable with Yahoo’s story, it still isn’t likely. I’ve already mentioned reason number 1 why that is the case. Now, let us imagine that EVERYTHING the dumb asses editing Yahoo! sports have let slip onto the web is actually true. The most detail the story offers comes in the reporting of Lloyd Lakes’ mother (yes, his mother) reporting she had heard the tapes her son made and more specifically that the tapes had LaMar Griffin, Reggie’s step father, promising to pay back money to Lake which had been used to help buy Reggie a car. Okay, so the image isn’t entirely accurate. USC escaping sanctions is much more likely to happen than Reggie Bush getting declared retroactively ineligible, which could still have dire consequences in terms of games USC might have to pretend like it never played. But seriously, for Bush to be declared ineligible, two things need to happen. One, Reggie needs to be on the tape himself talking or they need to find paper evidence tying what LaMar says on the tape to his step son. That might seem overly obvious, especially for the type of morons who have already “imagined” what the tapes might actually said and condemned Reggie in op/eds, but it turns out it isn’t. Two, the tape and verification of its authenticity (i.e. Lake testifying) need to get to the NCAA. Turns out there isn’t a whole lot of incentive (besides bitterness) for Lake to talk to the NCAA. It took a subpoena for him to even produce the tapes. The NCAA probably will not use any of Lake’s Grand Jury testimony and if he talks with the NCAA he will never have another pro or college football sports memorabilia deal ever again. Actually, for all that has gone down he might not have one ever anyway, but still, there are reasons including his ties to football that could easily dissuade him from talking to the NCAA. 2) The NCAA is not going to take away all of Bush’s 2005 season because Reggie’s step father admits the family took money. Anyone who thinks they will does not understand the politics of the situation. And they will not accept LaMar Griffin saying Reggie took money as the say all and end all piece of evidence. Reggie needs to be on the tape himself, or there needs to be a paper trial (say the car’s papers) tying Reggie to the things LaMar says. Indeed at this point, even with the tapes, I personally think the credit card receipt signed by Reggie Bush at The Venetian, that Yahoo! claims to have is the most damning evidence. The receipt is for a charge to Michael’s credit card but signed by Bush. The NCAA will not declare Bush ineligible over $600, but just from the quality (or lack thereof) reporting done for the “tape” story you have to currently put way more weight on a physical piece of evidence Yahoo! has actually seen. This report makes the situation look darker, but people are behaving like it has clouded the whole sky. At least hear what is on the damn tapes before you do that. And no matter what you imagine “fair” is understand that the USC football team is not the Hawaii Men’s Volleyball team. Finally, the stupidest comment of all that is being made is that Reggie Bush will forfeit his Heisman. It took people a while to catch on – I swear this story has educated people – but if you’re still in the dark, the NCAA has NOTHING to do with the Heisman trophy. Any Reggie Bush retroactive ineligibility ruling has absolutely no direct bearing on Reggie’s Heisman. Journalists love quoting the rule from the Downtown Athletic Club stating that a player must be in good standing to win the Heisman. Certainly, if Reggie became ineligible it would appear to violate that rule. If Reggie becomes ineligible for his junior year the DAC WILL ignore the rule unless they feel it is a good public prestige move not to. As long as Reggie’s popularity stays up (and I can’t imagine even this scandal denting it too much) I think that will be the case. That is the actual score. Facts in the situation which apparently escape any number of pundits and journalists. We are a long way from Reggie Bush getting declared ineligible and USC “forfeiting” previously decided games. We are even further from USC having forward looking sanctions handed down. And we are even further, further from Reggie Bush losing his Heisman. So while I, like many Trojan fans, am rubbing my hands together tensely, I am far from freaking out (which I might do if USC loses the 2004 National Championship). I agree that the likelihood of USC forfeiting games is low. However, if forfeits do somehow come to pass, the above reasoning makes me feel better about the situation. The AP and coaches’ polls are just like the DAC; in Div. 1-A college football, the NCAA actually has nothing to do with awarding national championships. So, any action taken by the AP or the coaches would also be political and PR related, and I just don’t see where they would have any incentive to conduct a revote. So, the way it stands is you are right…in a way. Here is how it will work. Let us imagine we have to pretend that every game Reggie played in, in 2004 is taken away. The NCAA has the power to make the school remove all reference to the Rose Bowl championship, to the PAC 10 championship we won this year, and even to the “unofficial” AP national championship in all merchandise and official publications. The school will never again admit that we won any championships that year (PAC 10 or national). However, on the AP’s rolls we would be listed as national champions, unless they went back themselves and independently and retroactively changed it.